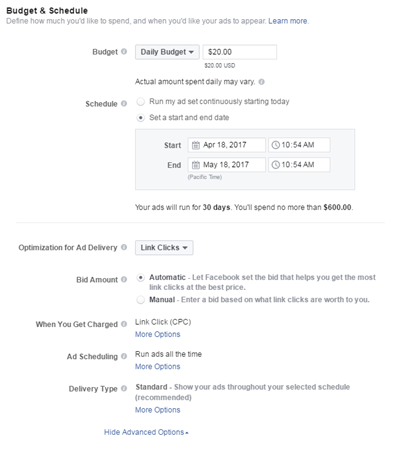 Facebook Advertising 101 is meant as a starting point for marketers just starting out and eCommerce DIY entrepreneurs trying their hand at Facebook ads. If you’d like some help we offer turnkey eCommerce Facebook Advertising Services. The days of print, radio, and TV as the only options for advertising are over. Thanks to the internet there are tons of ways to take advantage of having potential customers constantly looking at screens just waiting to see your ads. Today we are going to cover the basics of one of the best options in Facebook advertising 101. 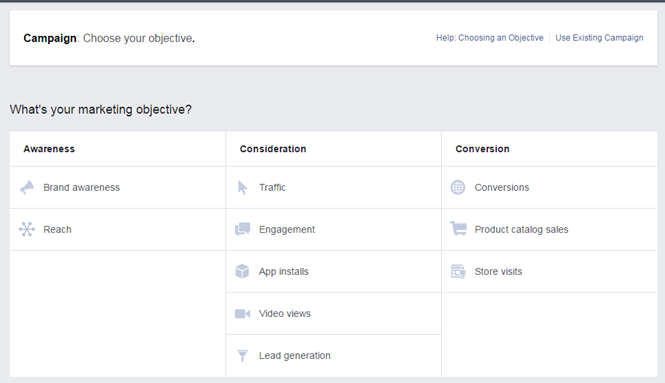 The next part of Facebook advertising 101 covers choosing your campaign objective and creating an Ad Set. At the Ad Set level, you get to choose who will see your ads. You can create multiple ad sets to target different groups of people. 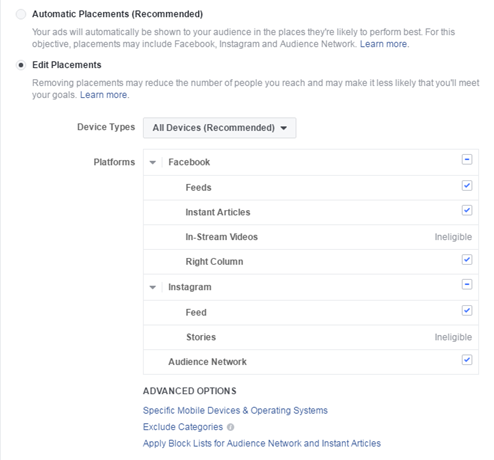 With Facebook targeting, you can choose between a Core, Custom, or Lookalike audience. We will go over the differences in each. This is a powerful way to target specific people. Facebook pulls data from what its users share and their behaviors allowing you to target based on demographics including Geography, Lifestyle, and Purchase Based. For example, you could target married couples who are in the market for a new car. If you sell items for children, you could target to parents. This is a great way to make sure that you don’t waste your advertising dollars on people who won’t be interested in your products or services. Don’t narrow your audience too much though, or you might not get a large enough user set. This is a group of people that you have imported into Facebook. Your imported list will be matched to Facebook users. You can also use it to remarket to people based on actions that they’ve taken on your website or mobile app. Create a Custom Audience using newsletter subscribers that didn’t convert on your last email campaign. Target people that left items in their cart with a special offer to get them to convert. Target your new customers with a Brand Awareness campaign to build familiarity and trust. You can also exclude custom audiences from campaigns. This is a group of people that share the same traits as your best customers. This is a strong tool to use if you are trying to gain more customers and expand your current audience to people most likely to be in your target market. You will need to have a seed audience of at least 100 people to use the Lookalike tool. This list should include people who are most important to your business with high-value purchases and/or are very engaged. Your list can come from a custom audience that you’ve created, your CRM database, or it can be made up of people who like your Facebook page. When creating your Lookalike Audience, you will choose your audience size. The larger your reach the less of a match the audience is likely to be. Some ads are not available for all placements. For example, a video ad for Instagram must be 60 seconds or less. Now you will choose your budget and optimization. You can choose either a daily or lifetime budget for your ad as well as the length of time it will run for. Depending on which objective you have chosen, you’ll have different optimization options. For example, if you have chosen video views as your objective, then you will be optimized for people most likely to watch your video. Please note that what you optimize for is not the same as what you pay for. An example would be when you optimize for conversions, then you will be charged per impression. Once you’ve chosen your format you can add your creative. You can upload your own images, or Facebook offers millions of free high-quality images. If you are using a video ad there is a great tool for Facebook that allows you to transcribe your video once it’s uploaded. Facebook will transcribe it for you, but we recommend reviewing it for accuracy before posting. Add your text, website URL and a call to action button and you’re all set! Just place your order and within about 15 minutes your ad will be reviewed. If approved, then it will instantly be live. If for some reason it’s not approved, you will be notified of any changes that need to be made to your ad. You can resubmit once it’s been updated. I hope you’ve enjoyed Facebook Advertising 101 for eCommerce business owners. If you’re interested in Facebook 102, it’s offered via email below. Reach out if you’re interested in learning more about having us manage your Facebook Marketing. Excels at squeezing every last drop of revenue out of a Digital Marketing Campaign. Sara has worked with a variety of ESP's and many different types of online retail marketing initiatives. Sara has a herd of dogs, enjoys Yoga, and the great outdoors. 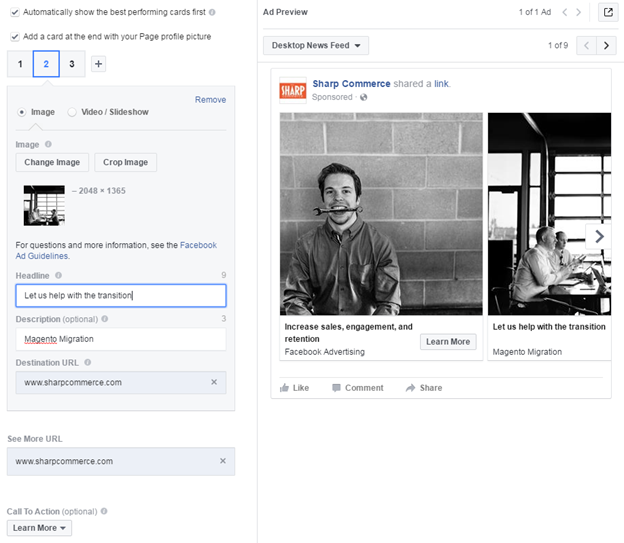 Ready to go beyond the basics with Facebook Marketing? We’ve got you covered! Enjoy our free guide to Intermediate Facebook Marketing 102 where we cover multi-touchpoint funnels. How Much Does Website Speed Increase Conversions?